As this issue of Tanzanian Affairs goes to press the country is gripped by election fever. At stake in the elections scheduled for October 31 2010 are the presidency and vice-presidency of the United Republic, the presidency of Zanzibar, hundreds of seats in the National Assembly and the Zanzibar House of Representatives, and thousands of seats for local councillors. 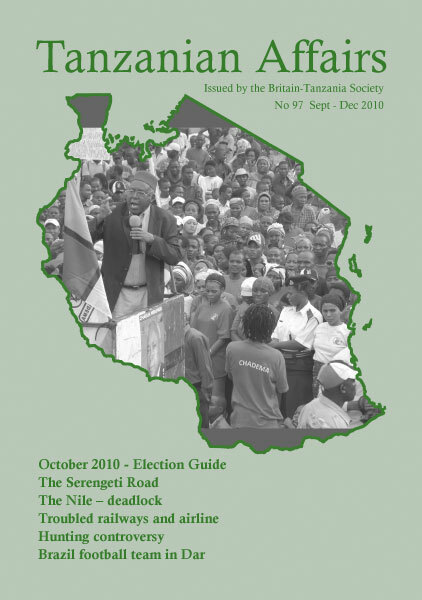 It is hoped that next issue of Tanzanian Affairs will contain an account of the final stages of the election campaigns and a summary of the results. Since the last elections in 2005 there have been a number of changes in organisation and procedures in the ruling Chama cha Mapinduzi (CCM) party aimed a making them more open and democratic. For example, the Party, which has ruled the country for almost 49 years, and has always ensured a tight control over selection of party election candidates by its Central and National Executive Committees (CC and NEC), has relaxed its grip this time. Candidates voted in by the people at primary elections have been approved by the party hierarchy in most cases. However, the earlier tight control, with its nationwide network of party cells and its quite remarkable – almost unique – skill in squelching any individual or group wanting to deviate from the party line, has given Tanzania years of unity and peace which must be the envy of troubled neighbouring countries. However, with the passage of time, people are beginning to reveal their discontent with the status quo and are beginning to protest more vigorously than they have before so that some election meetings this time had to be cancelled midway and candidates have been verbally attacked on a far greater scale than before. This has made for very lively election meetings. Efforts have been made also to reduce the rampant corruption evident in elections in the past. It has become a tradition for candidates, more numerous than ever this time, desperate to retain or gain power, to distribute money or other bribes to voters. This time however they found officers of the Prevention and Combating of Corruption Bureau (PCCB) at most of the primary election centres. Some were shocked to find themselves being arrested as they tried secretly to hand out bribes to voters. 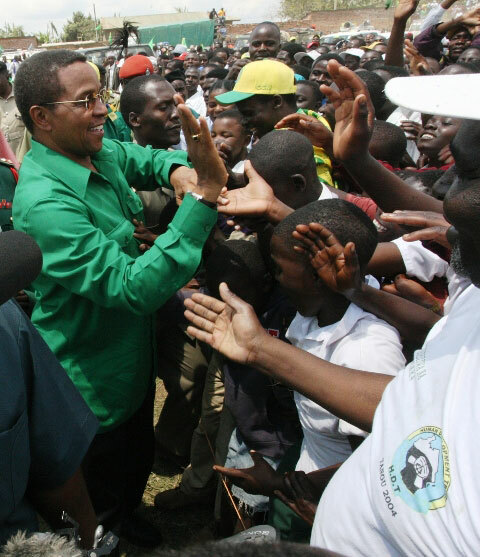 CCM – President Jakaya Kikwete for a second term. – For Vice President – Dr Ghalib Bilal. CHADEMA – Dr Wilbroad Slaa. – For Vice President – Saidi Mzee Saidi. 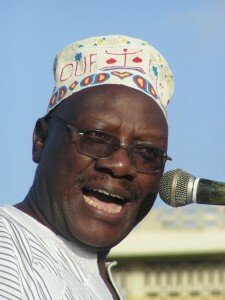 CUF – Professor Ibrahim Lipumba. – For Vice-President – Juma Duni Haji. There are a number of candidates from smaller parties also running. CCM – Presidency: Dr Ali Mohammed Shein. CUF – Presidency: Seif Shariff Hamad. Candidates from seven parties qualified for the Isles’ presidency and most are likely to stand in the election. They are the representatives of CUF, CCM, NCCR, TADEA, NRA, AFP and Jahazi Asilia. An example of the skill with which the CCM party hierarchy controlled and distributed power amongst the top candidates in the elections was seen in the selection for the top positions – the presidency and vice-presidency of the United Republic (one of whom must come from the Isles) and the presidency of Zanzibar. For the Tanzanian presidential candidate only two candidates submitted their names and one subsequently withdrew. The party then chose President Kikwete for a second term, virtually unanimously. For the two top posts in Zanzibar it was more competitive as eight leaders submitted their names. Among them were Chief Minister Shamsi Nahodha, former Chief Minister Dr Ghalib Bilal, Ambassador Ally Karume and Minister Ally Juma Shamhuna. After much speculation in the press, the final decision of the party’s NEC came as a surprise to many. It was important that Pembans, who normally vote overwhelmingly against the CCM, should be well represented, so the current Vice-President of Tanzania, Dr Ali Mohamed Shein, a Pemban, got the nomination for the presidency of Zanzibar. The Swahili media gave the impression that he was chosen because he has been working well with President Kikwete for the last five years and would be a ‘safe pair of hands’ in any future disputes between the mainland and the Isles. It was also important for prominent political leader Dr Ghalib Bilal, who had tried for the presidency before, to be given a top job. 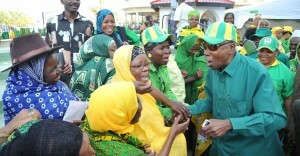 He therefore became the candidate for the vice-presidency of Tanzania. The choice of Dr Bilal was politically astute as former Zanzibar President Salmin Amour, who retains much influence in the Isles, was said to prefer him. It ensured that he and his many followers would remain loyal to the central government. This Zanzibar election will be different from the previous three, the results of which were widely questioned, as, in a referendum held just before the election campaigns began, the people of Zanzibar voted in favour of an agreement between the two main parties under which, whatever the result, the next government would be a coalition. In the referendum all 18 constituencies in Pemba voted ‘yes’ but in Unguja 8 out of 32 constituencies voted ‘no.’ In total 188,705 voted in favour of the proposal, while 95,613 rejected it. Zanzibar Electoral Commission (ZEC) Chairman Khatib Mwinyichande announced the results at Bwawani centre to cheers of “Ndiyo! Ndiyo! Ndiyo!” (Yes! Yes! Yes!) from a big crowd that had waited for the outcome for several hours. In addition to the discussions on the referendum the Zanzibar House of Assembly debated a constitutional amendment to give Zanzibar the status of a state which was contested initially because it was thought to be a violation of the Constitution of the United Republic. The amendment read: ‘Zanzibar is a state whose boundaries include the islands of Unguja and Pemba, formerly known as the People’s Republic of Zanzibar.’ All the 75 MP’s from both CCM and CUF voted for this amendment. This cleared the way for the Isles to have a government of national unity to end the long standing political antagonism between the two parties. The 18 opposition parties have once again failed to take advantage of an increasing pressure from voters for change. Instead they have devoted a large part of their energy and resources to fighting each other instead of combining to fight against the monolithic ruling party. Of the opposition parties only two are of real significance – The Chama cha Maendeleo (CHADEMA) because of its growing influence on the mainland and the Civic United Front (CUF) which, in previous elections in Zanzibar, has run neck and neck with the ruling CCM party. Although CHADEMA agreed not to oppose CUF in the elections for the presidency of Zanzibar there was little or no sign of reciprocity by CUF on the mainland. Traditionally, Tanzanian elections are based largely on the character of the individual rather than on party policy. But examination of the early speeches in the campaign gave an indication of some policy differences. Readers of Tanzanian Affairs will be familiar with the major policies of the ruling party and these are unlikely to change in the future. They include preservation of law and order including protection of the Albinos, encouragement of foreign investment, pursuit of those alleged to be involved in corruption, continued expenditure on social services and improvements in health and education. The current president began his campaign by addressing five rallies a day, using two helicopters. His speeches were carefully adjusted for each audience and the promises for the future were numerous. Less frequent were explanations on how these promises would be paid for. – Habari Leo. 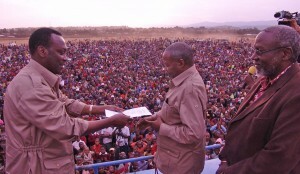 CHADEMA chairman Freeman Mbowe (left) hands the presidential candidate forms to Dr Wilbroad Slaa (centre) at a rally in Karatu. Right is Prof Mwesiga Baregu, chairman of the campaign committee (source Yahya Charahani). Dr Wilbroad Slaa has 15 years of experience as CHADEMA MP for Karatu. He became well known for putting out a ‘list of shame’ in 2007 naming allegedly corrupt ministers and key party officials, which prompted a series of legal threats against him by those accused. Despite vows that they would sue him for defamation, none of them went to court and the ‘list of shame’ was deemed accurate, earning Dr Slaa credibility as an anti-graft crusader in a country where corruption is said to eat up a third of the nation’s annual $9.0 billion budget. Dr Slaa told thousands of chanting CHADEMA supporters at the launch of his party’s campaign that, if elected, he would, during his first 100 days in power, mainly focus on restoring accountability, integrity and trust within the government. He said his administration would not tolerate corruption, embezzlement of public funds and misuse of the country’s natural resources. Dr Slaa said Tanzania was poor and underdeveloped largely due to poor leadership and weak policies and the plunder of natural resources such as minerals and wildlife. “Under my leadership, the issue of corruption will be history…we will take tough measures against corrupt leaders…. We will not tolerate the plunder of our natural resources by the so-called foreign investors, who instead of revamping privatised entities turn them into mere godowns,” he said. He went on to say that implementation of the 2010 CHADEMA manifesto, which has been dubbed “Hatudanganyiki” (We will not be cheated), was the surest way to deal with these shortcomings. His manifesto focuses on ensuring quality social services, such as education, water and health for all Tanzanians. His administration would offer free education from Standard One to Form Six and he would revamp agriculture, establish a robust industrial base, create better paying jobs, enhance security and develop sports and culture. Again, it was difficult to detect how these would be paid for. He said that that government expenditure was excessive and disproportionate (President Kikwete had squandered Shs 23 billion on refurbishing State House). He promised to start by trimming his own salary if elected. Payments of allowances and salaries would have to be cut back by 20% starting with the President and regional commissioners. Parliamentary and senior officials’ salaries would be slashed by 15%. Slaa pledged to expand the tax base while doing away with the rampant tax exemptions. He pledged to ban official posh cars, and reform the land law. He promised to remove taxes on construction materials to enable Tanzanians in rural and urban areas to build decent houses – Majira. Whether by coincidence or not, the CCM party has nominated a person known as Willbard Slaa to vie for Dr Wilbroad Slaa’s parliamentary constituency, Karatu, in the Arusha region. CHADEMA fears that this may confuse some voters who in the past 15 years have been used to the name ‘Slaa’ as their MP. Postscript: It is said that Dr Slaa did not want to take on the virtually impossible task of trying to unseat President Kikwete because it would mean that he would lose his safe parliamentary seat. The Swahili press has been alleging that, in agreeing to be persuaded by his Chairman, Freeman Mbowe, who wanted to stand for Parliament rather than try for the presidency, Slaa insisted that CHADEMA should pay him funds equivalent to what he would have earned as an MP over five years. Professor Ibrahim Lipumba, who has attempted three times unsuccessfully to become the country’s president, has spent many years as a lecturer in economics at the University of Dar es Salaam. He said the country was at a crossroads and needed new leadership. Shs 11 trillion had disappeared since President Kikwete entered office in 2005. “This is equivalent to the total government budget this year….When he took power he promised to deal with corruption but what happened had been delusion and deception. The real culprits have gone free while those taken to court were facing diluted charges which eventually might be dropped.” He cited examples of the soaring cost of living and presented his elections manifesto, promising a new constitution and a government of national unity. He also challenged Kikwete to have a live debate so that people could decide how to vote. The President refused. Significantly, to put fears at rest, he said that he would strengthen the Union between Zanzibar and the mainland – Mwananchi. THE Civic United Front (CUF) has nominated 120 candidates from the Mainland and 50 from the Isles to vie for Union parliamentary seats. It has also nominated 50 others from the Isles to contest seats in the Zanzibar House of Representatives. CUF National Chairman Lipumba said that his party had invited CCM members who lost in the election primaries wishing to join CUF but added that there would be no automatic nominations for various leadership positions in the party. He claimed that he cherished the idea of an alliance among the opposition parties, saying it was the best approach to challenge the ruling party more strongly, but insisted that he (Prof Lipumba) was the best candidate for the union president with a vision for change. However, he wished Dr Wilbroad Slaa all the best in his bid for the presidency. MP’s unsuccessful in the primaries included Minister for East African Affairs Dr Deodorus Kamala (Nkenge), Deputy Minister for Fisheries and Livestock Development James Wanyancha , Deputy Minister for Health and Social Welfare Dr Aisha Kigoda, Deputy Minister for Education and Vocational Training Mwantumu Mahiza, Deputy Minister for Natural Resources and Tourism Shamsa Mwangunga and Deputy Minister for Information, Culture and Sports Joel Bendera (Korogwe Urban). Former Planning Minister Dr Juma Ngasongwa (Ulanga West) also lost. Other prominent MP’s who lost included Joseph Mungai (Mufindi North), Dr Ibrahim Msabaha (Kibaha Rural) Prof Philemon Sarungi (Rorya), John Shibuda (Maswa), Felix Mrema ( Arusha Urban), William Shelukindo (Bumbuli), – Guardian on Sunday. Some ten CCM MP’s said to have ‘ganged up’ against prominent CHADEMA MP Zitto Kabwe (Kigoma South) and caused his suspension from parliament in 2007, have been defeated in the CCM primaries. They spoke vehemently against a private motion that was tabled by Kabwe on an issue at Buzwagi gold mine and demanded that he be punished. Subsequently, Kabwe was suspended but not before he cursed them, predicting that they would not be returned in 2010. Kabwe’s prophesy seems to have been fulfilled and now he has the last laugh – Tanzania Daima. Four cabinet ministers, including Prime Minister Mizengo Pinda, the Foreign Affairs and International Cooperation Minister, the Minister for Water Prof. Mark Mwandosya and Ms Celina Kombani, Minister of State in the Prime Minister’s Office, have been returned to parliament unopposed. Altogether CCM is starting off the elections with a lead of 13 unopposed MPs. Opposition parties have protested in some cases – Habari Leo. The PCCB held a CHADEMA candidate over an alleged Euro 1,000 bribe in Musoma. Again, there were many similar cases – Nipashe. CCM Secretary General Yusuf Makamba said that CHADEMA’s presidential candidate Wilbroad Slaa could not be trusted to respect the presidential oath of office while he failed to stand by the oath he took as a priest. Makamba said: “He took the oath of obedience and chastity but he broke it. He got married and then divorced his wife and now he goes around introducing his fiancée at rallies. How can he be trusted to run the country?” – Habari Leo. CUF suffered a blow in its one time stronghold in the Lake Zone – Bukoba Urban Constituency – when its local leader and former CUF MP Lwakatare defected to CHADEMA in 2008. CUF admitted that they were facing difficulties due to what they described as foul play by CHADEMA youths and leaders. “These leaders are doing all they can to tarnish CUF’s image and are provoking us to react negatively” said a spokesman. The ‘Daily News’ reported the flags of CHADEMA flying near CUF’s flags in several places and at one CUF branch, CHADEMA placards were placed on the wall of a house flying CUF’s flag. A CHADEMA spokesman said: “Akili ni nywele, kila mtu ana zake” loosely meaning everyone has their own way of doing things. CUF speakers have pointed out that Tanzania was in the bottom ten percent of the world’s economies in terms of per capita income, with an estimated Gross Domestic Product of $22.1 billion or $550 per capita. The most spectacular casualty in the CCM primaries was veteran CCM statesman and former Prime Minister and High Commissioner in London, John Malecela, who was defeated at Mtera by a young and upcoming politician called Livingstone Lusinde. The NEC sustained Lusinde’s victory after former President Ali Hassan Mwinyi was reported to have asked NEC members to uphold the primary results. Several CCM candidates are facing objections on grounds of nationality or forgery of documents and CHADEMA and CUF have filed objections – Habari Leo. The government has won again in its determination not to allow independent candidates to stand for election. The Court of Appeal has ruled that the private candidates issue can only be settled by parliament which has jurisdiction to amend the constitution. The Minister of State in the Prime Minister’s Office, Philip Marmo has said that the party set up four months earlier to oppose CCM, the CCJ, would not get permanent registration before the October elections because the Registrar of Parties had no funds to carry out the process of verifying CCJ membership, as required by law. The CCJ is one of six parties waiting to be registered – Tanzania Daima. Finance Minister Mustafa Mkullo, who is standing for the Kilwa seat in parliament, said he was surprised by allegations by some elders that he was a citizen of Malawi. “If I am really a foreigner, how come they didn’t question my nationality in 2005? I am confident because I was born in Kimamba and raised in Kilosa,” he declared. He had emerged winner in the primaries with 6,000 votes – Nipashe. The Tanzania Media Council (MCT) has issued a statement condemning media outlets that are used as agents of political parties, calling upon journalists to stop wearing party colours and to stick to professional ethics. MCT Executive Secretary Kajubi Mukajanga said it was unprofessional for reporters to display political slogans while covering party campaigns. They should also stop being biased in their reports and make sure that all political parties got fair coverage. Journalists are not supposed to be more Catholic than the Pope while reporting elections,” he said – Mwananchi. With Westerners so accustomed to criticising the often flawed elections in African states, 11 parliamentarians from Commonwealth countries in Africa and Asia observed how the recent British elections went. It was not always a pretty sight. People being turned away from polling stations, ballot papers running out and sit-in protests by disgruntled voters were perhaps not what the Commonwealth observers were expecting to see in one of the world’s oldest democracies. The UK Electoral Commission announced an official investigation after queuing voters were unable to cast their ballots in a few polling stations that closed promptly at 22.00. But even if British politicians are extremely nice to one another within a coalition government, Mr Kabudi thinks coalition will be a “daunting” experience for the UK – BBC News. A proposal by President Kikwete to build a road through the Serengeti National Park has created a storm of protest amongst wildlife supporters around the world. So much so that the New York Times, which rarely features Tanzania, has devoted a leading article (August 30) to the subject under the heading: The Wrong Road (Thank you Peg Snyder for sending this – Editor). Extracts: ‘In late July, President Kikwete announced that his government intended to go ahead in 2012 with plans to build a highway running from Arusha …..to Musoma. No one disputes the economic value of developing highways in Tanzania. But this planned highway includes a potentially tragic pitfall: it cuts straight through the heart of the northern Serengeti, one of the greatest national parks on the planet. It would bisect the route of the great migration, the annual movement of more than a million wildebeest and other herds. President Kikwete has promised that this would only be a gravel road, and has said that he would never build anything that could harm the ecosystem. 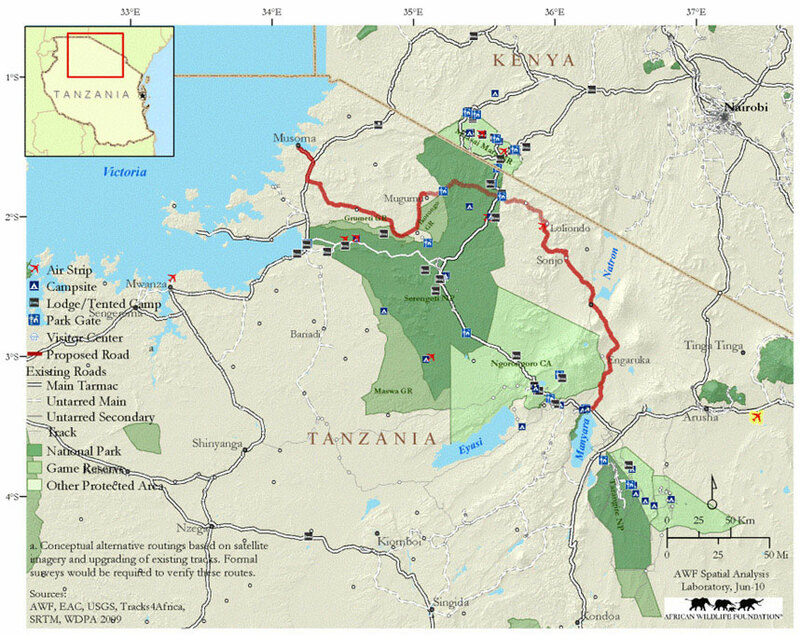 Tanzania could still protect the integrity of the park…. There is an alternative southern route, one that would link more unserved communities than the northern route and still leave the Serengeti intact. However, the alternative southern route would be significantly more expensive, particularly since few dispute that better roads from Arusha to Loliondo and Musoma to Mugumo are required. The government is therefore left with a difficult decision on whether to complete the link with a road between Loliondo and Mugumo, or else pay for a completely new road to the south of the National Park, the route as yet unsurveyed, but perhaps via Bariadi. The former would represent around 130km of road, including 50km through the Serengeti, much of it on existing tracks, while the alternative southern route would entail over 500km of road, and would arguably not represent a significant enough improvement over the existing road link via Singida and Shinyanga to justify the enormous expense involved. In early September President Kikwete, in a nationwide broadcast, indicated that he was unrepentant. He said the project was part of a policy to link all regions with permanent roads. He added however that, in view of the need to protect the environment, part of the road would not be macadamized. “I would like to assure our friends abroad that I am an ardent supporter of the Serengeti reserve so I will be the last person to supervise any environmental degradation” – Nipashe. The difficulty involved in successfully prosecuting the many corruption cases now being tried in Tanzania has been illustrated by the completion of the first stage of a significant case. However, the magistrates taking the case were not in agreement on the verdict; two were for and one against the sentence of two years in prison for the accused person. The lawyer for the accused immediately appealed and the suspect was then released on bail. In a detailed account of the final days of the trial, published in Mtanzania and other papers, the Bank of Tanzania’s former Director of Personnel and Administration Amatus Liyumba was found guilty of abuse of office. While two members of the panel were satisfied that Liyumba unilaterally changed the scope of the Bank’s ‘Twin Towers’ project outside the law, regulations and BoT procedures, the chairman of the panel, Principal Resident Magistrate Edson Mkasimongwa said he was of the view that the prosecution had failed to prove the charge beyond any reasonable doubt. The newspaper reported that there was a stony silence in the packed courtroom as it was stated that there was no way the accused could escape liability after he arbitrarily changed the scope of work without consulting the central bank’s governing board. Liyumba remained calm and composed in the dock as the sentence was being read out. However, tears flowed freely among some of his relatives after he was sentenced to two years’ imprisonment. Liyumba, who served the central bank for 35 years before he retired in 2008, was initially charged with two counts of abuse of office and causing the government a Shs221 billion loss, but the court acquitted him of the second count for lack of evidence earlier. Liyumba first appeared in court in January 2009, when the prosecution alleged that he and former BoT Governor Daudi Ballali, who has since died, changed the scope of work of the extension project, raising the construction cost substantially. The prosecution’s case banked heavily on eight letters signed by Liyumba, which instructed the lead consultant to change the scope of the work. But Liyumba denied the charge, saying he only provided administrative support to the project, and did nothing other than convey decisions made by the management to the lead consultant. He maintained that the letters were approved by the Governor, and that he could not have signed them without consulting him. Liyumba told the court that he was verbally authorised by the Governor to sign the letters on behalf of BoT as the project manager could not do so because he was not an employee of the central bank. The problems facing Tanzania Railways Ltd (TRL) have not been resolved (they have been described in several issues of TA) but a number of new developments have been reported during recent months. In May it was revealed that the India-based firm RITES was demanding $86 million (about Shs 125billion) as the cost of ending the 25-year deal it had signed with Tanzania three years earlier. However, the Guardian on Sunday claimed that the company hadn’t invested any money in the railways during all this time. The paper alleged that RITES had expected to use the TRL’s shares and assets it acquired in order to borrow $400 million from the International Finance Corporation/World Bank. As the quality of service on the main lines declined, the paper said, the government eventually agreed to buy back the 51% of shares RITES owns. Then, alarmed by the financial report presented by RITES, the government’s negotiation team was said to have asked for an independent auditor to verify the books of accounts, before any compensation deal could be reached. RITES apparently did not agree to this. 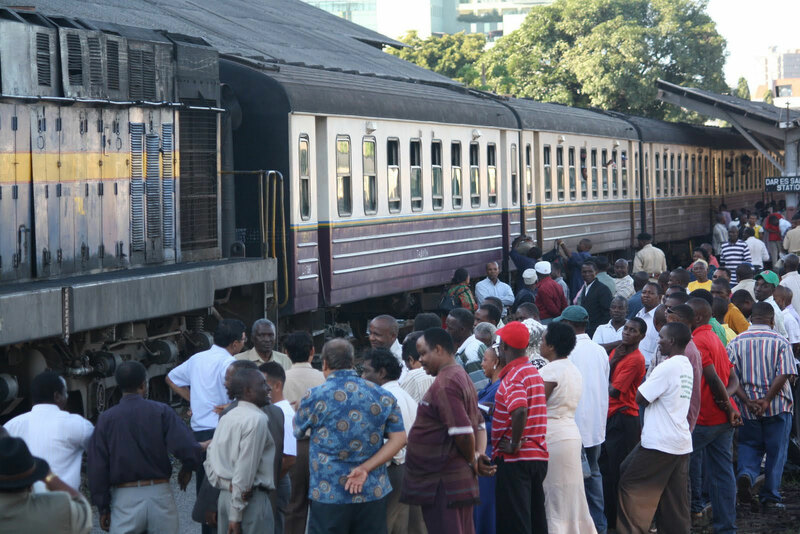 On June 8 the Daily News reported that the government had formed an interim management team to run Tanzania Railways Limited (TRL) while the government looked for a reliable and serious investor. RITES management had agreed to hand over the assets and operations of TRL as a decision to this end had been made by shareholders on both sides of the partnership. The Tanzania Zambia Railway Authority (TAZARA), a company built with $500 million Chinese aid in the 1971’s and jointly owned by Zambia and Tanzania, is also in serious operational and financial trouble due to a fall in traffic and the old age of its locomotives, which have not been well maintained. The railway line runs some 1, 870 kilometers from Dar-es-Salaam to Zambia’s Kapiri Mposhi. New Managing Director Akashambatwa Mbikusita-Lewanika, who was appointed in 2010 has said that the management is determined on turning around the company. It had developed a 2010 action plan which indicated what should be done to bring efficiency to the company. The company was expected to spend about $520, 000 on repairing 500 defective commercial wagons this year. The company currently had 1, 853 commercial wagons, of which only 988 were running. This rehabilitation exercise would see the company increasing its volume of cargo from the current 15, 000 to at least 72, 000 tons per month. The company’s liquidity problems had resulted in it accruing a huge debt which it was currently trying to off-set. In 2008 the two governments had signed an agreement with the Chinese which would cover the provision of equipment, materials and other technical services valued at $40million and, in 2010, the Chinese gave the company a $39 million interest-free loan to revive its operations. The Daily News (August 8) published a highly critical article saying that TAZARA’s low cargo load represented nothing but death itself. This view was in contrast to a TV documentary shown on British TV which was surprisingly up-beat. The programme showed a very open management struggling with great determination and remarkable resourcefulness. Among the suggestions made in the Daily News was that TAZARA should open its CEO position to international competition. ‘They should just borrow a leaf from the success of Kenya Airways (KQ) which employs the service of foreign experts in some of its important departments.’ It quoted a number of companies wanting to use the line including Tanzania Breweries, Mbeya Cement, Mufindi Paper Mills, plus the Chinese company mining coal in Chunya. Minister for Infrastructure Dr Shukuru Kawambwa, has revealed some of the problems facing Air Tanzania (ATCL). He said for several years government has been trying to bail it out by pumping in more and more capital, but it continued limping. As a result it was decided that as from June this year the airline would be restructured. “It is not enough to do minor jobs. We intend to transform ATCL into a new airline with the cooperation of the private sector,” the Minister said – Nipashe. He said efforts by the government to find a reliable investor for the cash-strapped airline were continuing. The Chinese firm China Sanangol International Limited (CSIL), which had earlier shown interest, appeared to be withdrawing. The Minister said that ATCL was spending more than it earns. The firm’s revenue between July 2009 and March 2010 was Shs 7.8 billion while its expenditure stood at Shs 26 billion. During this period ATCL had carried a total of 63,362 passengers and 253 tonnes of cargo. The Communication and Transport Workers’ Union (COTWU) has also registered its concern over the plight of ATCL, which they said they saw collapsing unless concerted efforts were made to resuscitate it. Air Tanzania Corporation Limited (ACTL) management stated in April that it could not repair the B737-200 aircraft that crash landed at Mwanza airport in February since the cost of doing so would be too high. The Corporation would be referring the matter to its insurance company – Guardian on Sunday. One of the main features of the new government policy of Kilimo Kwanza (Agriculture First) is that certain unused government-owned land and other land not being adequately farmed might be leased out to local and foreign firms to use for large scale farming. But this idea is coming under increased criticism in Tanzania and amongst NGO’s and other activists abroad. They point out that China has secured land in the Democratic Republic of Congo roughly the size of Belgium to set up the world’s largest palm tree plantation and that Rwanda has signed a $250 million investment deal to produce 20 million litres of biodiesel per year from jatropha, a hardy ‘wonder plant’ that can grow in low-quality soil. They claim that all over Africa what they describe as ‘land grabbing’ is speeding up. They warn of possible water shortages, evictions of farmers and corruption. Tanzania is being criticised for its lack of policy to guide biofuel investment. According to the Tanzania Investment Centre, the country has over 33 million hectares of uncultivated, arable land. But ‘uncultivated’ doesn’t mean ‘unused.’ For many villagers such land is a source of firewood, medicinal herbs and building materials. When foreign investors come, locals get displaced. Moreover, loss of economic opportunities is rarely included in compensation for land legally belonging to a village. In Kilwa District villagers were paid less than $10 per hectare by a biofuel company for giving up their right to their farms. The International Institute for Environment and Development, a London-based think-tank, calculated that in some cases the value of timber harvested from such land each year is higher than the compensation the villagers receive. – Kenyan Nathan Mutei was sentenced to 17 years in prison with hard labour after admitting in a Mwanza court that he wanted to sell a fellow Kenyan Albino, Robinson Mkwama, for $260,000. Mutei pleaded guilty on 18th August. Almost 50% of the murders of persons with albinism between 2006 and 2010 were committed in Mwanza region. Mutei will serve the jail term in Kenya. In his plea of mitigation Mutei explained to the court that he arrived in Tanzania in June this year with the intention of seeking a witchdoctor for his personal problems. But the witchdoctor told him that he had to bring albino organs. On August 10th he left to find a person with albinism in Kenya. Two days later he was back in Mwanza and ready to sell Mkwama but walked into a police trap. – Three men are on death row after the Kahama High Court found them guilty of brutally killing a 13-year-old boy in Shinyanga region in December 2008. The men, including a witchdoctor, severed the legs and took them to the home of the sangoma. – Also in Kahama, in April 2010, a thirteen year old girl narrowly escaped death after three men severed her right arm. The men broke into her home where she was sleeping with her mother, terrorised the occupiers of the compound using hand grenades and shooting in the air and ordered the family to pour kerosene on the girl’s severed arm ‘to stop the bleeding’. When they could not find kerosene, they broke into a shop nearby, stole the liquid and handed it to the family members before speeding off. – In April 2010 a four-year-old child in Kigoma Region had her left leg and left arm chopped off and was left to die just 200 metres from her home compound. – Four men including village leaders are to hang for the brutal slaughter of 54-year-old Lyaku Willy in November 2009 in Shinyanga Region. Lyaku’s headless body was fished out from the River Kidamlida. His head and legs were recovered from the home of one of the killers. – Kazamiri Mashauri is facing the hangman’s noose for the ferocious slaughter of five-year-old Mariamu Emmanuel on 21st January 2008 in Misungwi District, Mwanza region. The fifty-year-old man was convicted by the Mwanza High Court in July. Kazimiri and three others entered the house, slashing Mariamu’s throat open, drinking her blood before severing her legs and vanishing in the darkness. This new agreement, the ‘Nile River Basin Cooperative Framework’ was signed by Ethiopia, Rwanda, Tanzania and Uganda, but was left open for a year in the hope that others among the nine states involved, in particular Egypt and Sudan, would join later. The agreement also transformed the ‘Nile Basin Initiative’ into a permanent ‘Nile River Basin Commission.’ Kenya signed on 19 May. Egypt’s Water Minister said: “Any project that takes away from the river’s flow has to be approved by Egypt and Sudan in accordance with international treaties.” But, according to Kithure Kindiki of the School of Law at the University of Nairobi, neither the unilateral claims of Egypt on maintaining the status quo on the Nile, nor the threat by upstream states such as Tanzania, to obstruct the Nile-Victoria system, are supportable in law. The new agreement attempts to review two deals signed in 1929 between Egypt and its former colonial power, Britain, and in 1959 with Sudan. The accords gave Egypt and Sudan up to 87% of the Nile’s flow. Egypt was also given the power to veto dams and other water projects in upstream countries. To monitor the water levels, it maintains teams of engineers along the river. “Egypt’s historic rights to Nile waters are a matter of life and death. We will not compromise” said the Egyptian Minister of Legal and Assembly Affairs. The Sudan indicated that it would not sign the agreement until all the nine states reached a solution to the issues in dispute. But this position could change if Southern Sudan voted for independence in a 2011 referendum. Ethiopia wants to build more dams on the Blue Nile, Sudan has promised foreign farmers vast pieces of land, in Kenya farmers want to expand irrigation and Tanzania intends to build a 170 km pipeline from Lake Victoria to supply dry areas. On July 27 Egypt offered an olive branch by offering to dig 230 water wells including 30 in Tanzania as part of its development assistance programme. 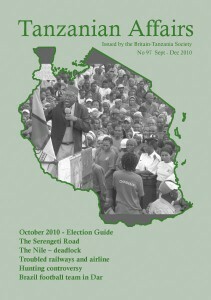 Eventually it was decided to try again at an emergency meeting to be held in Nairobi between September and November 2010 but Ethiopia, Uganda, Tanzania, Rwanda and Kenya reiterated that they would not backtrack from the framework agreement which they had signed and which seemed to give them a chance to obtain greater access to the Nile waters.